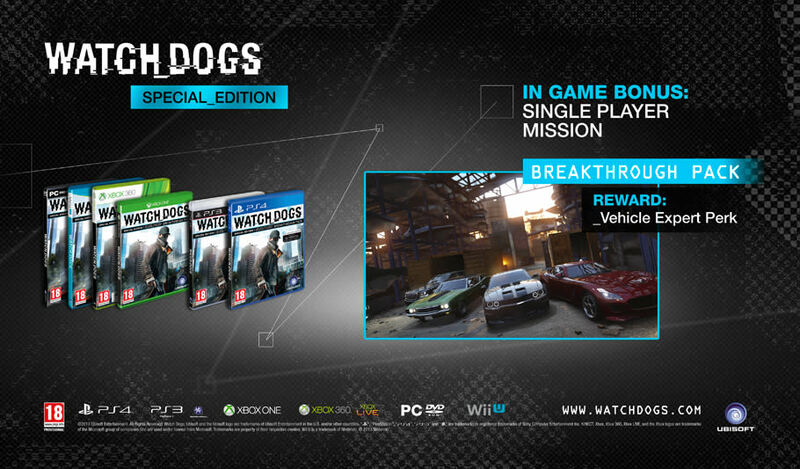 This GAME Exclusive edition of Watch_Dogs includes a bonus single player mission and a free vehicle and discount on selected cars. The world is literally at your finger-tips as you play brilliant Hacker Aiden Pierce, former thug now using his techno genius to avenge his family. With your phone in one hand and Baton in the other you’re ready to dish out justice, but if things get too much you can always break out the firepower. 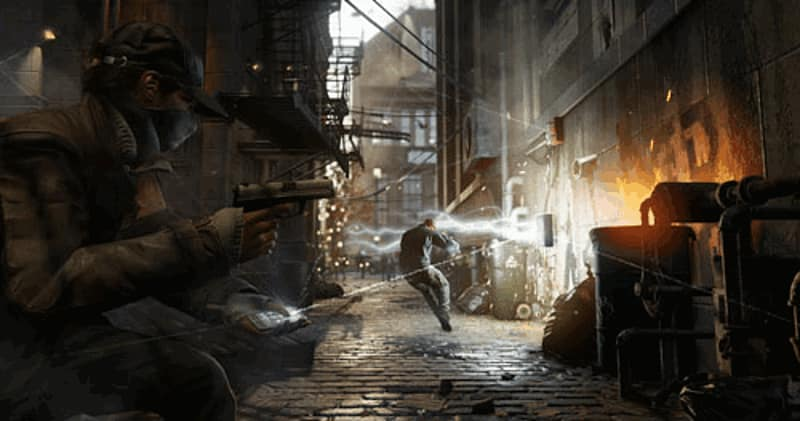 Navigate the city streets of Chicago on foot or in a vast collection of cars, and if your on the run or on the hunt, cut through the alleys, buildings or take to the rooftops. 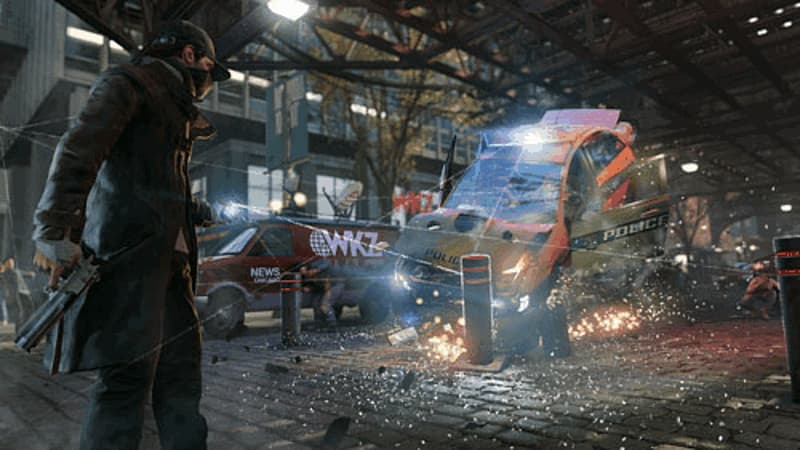 Watch_Dogs is powered by Disrupt, a dedicated engine that delivers a stunning and realistic experience. 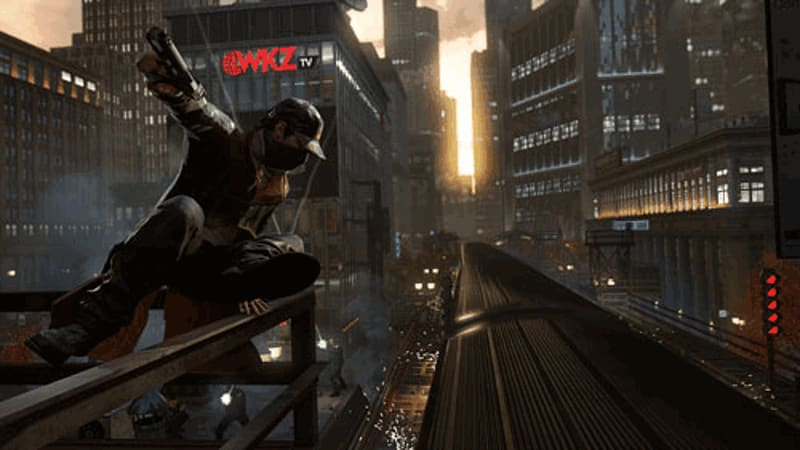 Become a vengeful hacker in a city where everything is connected in the cutting-edge adventure Watch_Dogs. 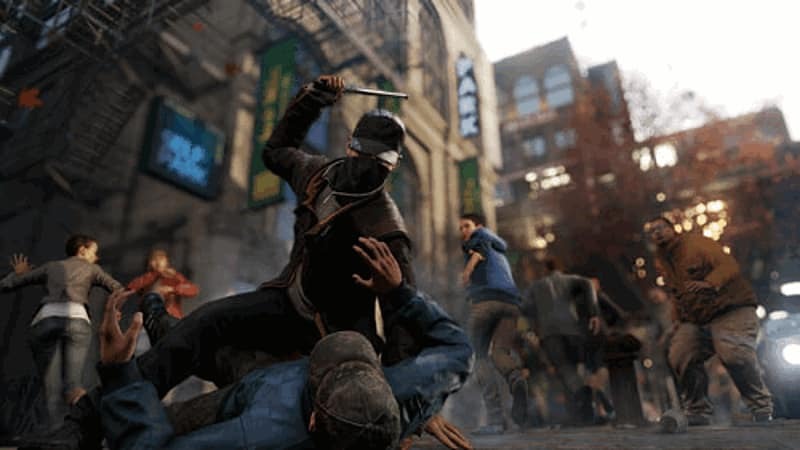 Watch_Dogs introduces a world not too removed from our own, a world where everyone uses the latest gadgets and gear to learn about the world and connect with friends with a simple swipe of the finger. But with that same simple swipe, with that same social connection, we leave a digital shadow that is always growing. An online trail that tracks our every move and milestone, our every like and dislike. And it’s not just people. All major cities are networked, with urban infrastructures constantly monitored and controlled by complex operating systems. In Watch_Dogs, this system is called the Central Operating System (ctOS). It controls almost every part of the city, from stoplights to bankvaults, mobile phones to business databases. And it holds key information on everyone in the city. This is where you come in. You play as Aiden Pearce, a brilliant hacker and former thug, whose past led to a violent family tragedy that changed you forever. Now your skills are no longer for personal, criminal gain – you'll be using them to hunt down those who hurt your family. Using your cyber-skills, you can monitor and hack everyone and everything that surrounds you by manipulating the city’s network. Access omnipresent security cameras, download personal information to locate a target, control traffic lights and public transportation to stop the enemy, and much, much more. The city of Chicago is your ultimate weapon to exact your own style of revenge. Hack The City - Watch_Dogs takes place in a fully simulated living city where, using your smartphone, you have real-time control over the city’s infrastructure. Trap your enemy in a 30-car pileup by manipulating the traffic lights. Stop a train, and then board it to evade the authorities. Narrowly escape capture by quickly raising a drawbridge. Anything connected to the city’s ctOS can become your weapon. Street Justice - Living in inner city Chicago where violence is best answered by violence, you have the skills to take the fight to the streets. Take down enemies by delivering devastating blows with your baton, or experience a shoot-out like never before with a physics simulation that rivals anything in the shooter category. Overall, you will have access to more than 30 traditional weapons. High Octane - With help from Ubisoft Reflections, the acclaimed studio behind the award-winning Driver series, Watch_Dogs offers a stable bursting with horsepower. Get behind the wheel of more than 65 vehicles, each with state-of-art physics and handling, and explore the massive city while completing missions. Everything Is Under Control - Disrupt, the all-new game engine dedicated to Watch_Dogs, uses advanced processing and graphics to deliver a stunning visual and an incredibly realistic experience. Disrupt gives you the power to affect the story, the city and the life of the population with your choices creating a ripple effect throughout the city. Dynamic Navigation - Watch_Dogs gives you the ability to not only use the city’s ctOS to your advantage, but the streets as well. 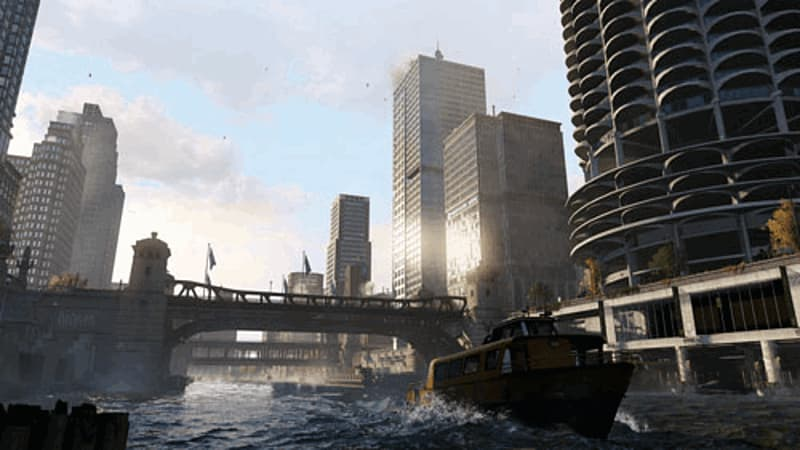 In real-world Chicago, cut through one of the buildings or climb to the rooftops to catch your target. 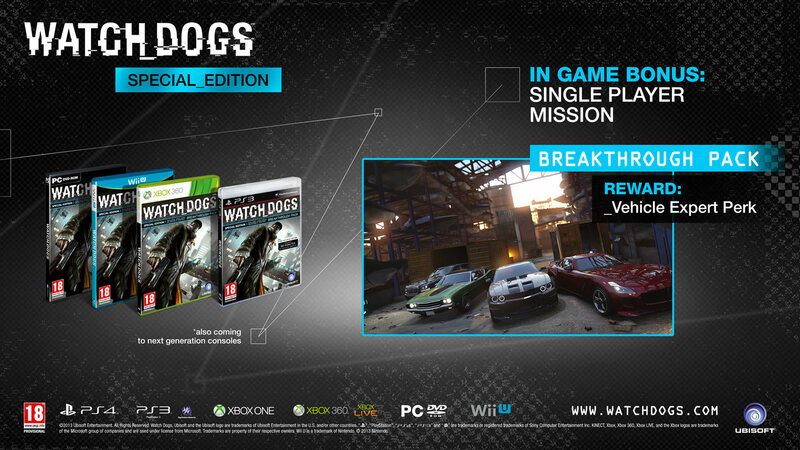 The Watch_Dogs special edition contains bonus in-game content: the bullet drive single player mission! Breakthrough mission pack - A secret gathering is underway. The Chicago Club is negotiating power with Corporate CEOs. The Club has hired scramblers to block surveillance devices. Drive around the city to find the scramblers and take them out. Retrieve all names from the meeting and upload their images to the world. Vehicle Expert Perk: Get free vehicles from your Underground Car Contact and earn discounts on select cars.